The “New” Ray Robinson Wants to Fight WBC Champ Danny Garcia”! The “New” Ray Robinson, 21-2 (10), of Philadelphia has to wait for the outcome of the March 4th showdown between WBC welterweight champion Danny “Swift” Garcia, 33-0, and WBA champion Keith Thurman, 27-0, unification fight before trying to get Garcia in the ring. Robinson turned professional in December of 2006 at the Paradise Theater, in the Bronx. This followed various ventures such as Foxwoods, Bally’s in AC, back in the Bronx, then Bourbon Street in Merrionette Park, IL, and the Mohegan in CT, until his eighth fight before he fought in his hometown of Philadelphia at the National Guard Armory. Robinson was unbeaten after eleven fights when he met Brad Solomon, 8-0, at the Manhattan Center Grand Ballroom in NY losing a majority decision over eight rounds. His promoter Joe Deguardia of Star Boxing had him all over especially in Deguardia’s home base of NY some six times. 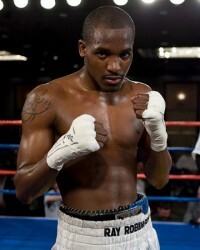 In Robinson’s tenth fight he defeated Darnell Jiles, Jr, 8-0-1, in the Roseland Ballroom in NY. Next he defeated Harrison Cuello, 18-10-3, at the Hilton Rye Town Hotel, in Rye brook, NY. Then came his first loss to Solomon and seven months later in his next fight a loss to Shawn Porter, 15-0, in DeSoto Civic Center in Southhaven, MS. Usually a promoter/manager comes back with something easier after a boxer’s first loss in particular but not in this case. “Porter told me after the fight he would never fight Ray again,” said Moses Robinson. He was Ray’s first trainer from the time he was 9 years old. Just a couple of months later it was back to Philadelphia again at the Armory and the Asylum Arena for a pair of wins. Then in the Philadelphia suburbs he won the vacant PA State title when he defeated Olympian Terrance Cauthen, 36-7, for Brittany Rogers BAM Boxing debut. She has been with J Russell Peltz learning the business but believe me she knows her boxing. Robinson then signed up with a group in DE and had his next five fights there for them. First he won the interim WBA-NABA welterweight title defeating Alberto Morales, 11-1-1, at the Chase Center in Wilmington, DE, in February of 2013. Next he stopped the dangerous “Sugar” Ray Narh, 26-2, of Ghana fighting out of Brooklyn, in seven rounds for the vacant USBA title at the Bob Carpenter Center, in Newark, DE. Then came the Russian Aslanbek Kozaev, 25-0-1, with Robinson winning over twelve rounds for the vacant WBO NABO title at Dover Downs Hotel & Casino in February of 2014. Robinson got as high as the WBC’s No. 3 contender after that win. Then a pair of wins over lesser opponents like George Sosa, 13-7 and Daniel Sostre, 13-9-1, at Dover and back to the Chase Center he would start dropping in the rankings to No. 5. In his lone fight in April of 2015 he defeated Sherzodbek Alimjanov, 22-2, of UZB, in a defense of his WBO NABO title. Then a major setback happened when Robinson was in an automobile accident. He would be inactive for eighteen months before returning to action on a Hard Hitting Promotions show at the SugarHouse Casino in Philadelphia in October of 2016 stopping Santos Benavides, 25-10-2, of Nicaragua at the end of the fourth round. He is scheduled to return to action at the same casino for Hard Hitting on February 3rd. He’s taking on another Nicaraguan in Edwin Palacios, 12-4-1 (8), who has defeated an 18-2 opponent and drew with a 16-2 opponent. Robinson dropped in the WBC rankings to No. 9 but looking to move back up! “Ray can’t catch a break getting a title fight. Angel Garcia brought Danny down for sparring with small gloves. I told him we don’t spar with small gloves. They did spar with larger sparring gloves and Ray did fine with Danny. I started with Ray from the time he was 9 years old,” said Moses Robinson. Being a tall southpaw who has good lateral movement it’s not easy obtaining a bout with the rest of the contenders. “We tried to get Ray a fight with Lamont Peterson but got turned down,” said manager Dave McWater. Peterson, a former super lightweight champion lost a controversial bout to Garcia. Robinson’s long-time trainer Moses Robinson stepped out of the picture due to health problems. His current trainer is Bozy Ennis whose gym is “Bozy’s Dungeon” in North Philly whose older two sons Farah and “Pooh” won NABF and USBA titles. Now he has what this writer calls the “best prospect in Philly since Meldrick Taylor” in “Bozy’s” younger son Jaron “Boots” Ennis whose 9-0 (8). His current promoter is DiBella Entertainment. “Boots” gives Robinson good sparring. Philly is still known for their gym wars and various fighters have either fought each other in the amateurs or sparred in the gym. Besides Garcia there’s “Hammerin” Hank Lundy and Ray “Tito” Serrano who is one of Star Boxing’s fighters. Both have sparred with Garcia. Robinson just turned thirty-one on the twenty-first of January having put in over ten years in the business. This writer was able to do a Q&A with him recently. He always has an “up” side and is easy to communicate with. KEN HISSNER: Well Ray you are continuing the journey to get that WBC title fight. Now it could be Thurman instead of Garcia come March holding that title. What is your prediction? RAY ROBINSON: Good fight. Whoever has the better jab will win. KEN HISSNER: It’s been ten years in the professional ranks for you starting with Moses and now “Bozy” who are two of the most respected trainers in Philly. How much of an adjustment was that? RAY ROBINSON: They are the two best trainers in Philly. Bozy was in the corner with Moses early in my career for 3 or 4 fights. Bozy doesn’t try to change your style just add on to it. KEN HISSNER: I know you’d love to fight fellow Philly boxer Danny Garcia. Have the two of you ever sparred? RAY ROBINSON: I used to beat him up sparring. I fought him in the Nationals and lost a bad decision. Everyone knew I beat him. KEN HISSNER: You’ve been in with unbeaten boxers starting with Jiles before major opponents back to back with Solomon and Porter while more recently with Kozaev. Were you surprised after losing a majority decision with Solomon your promoter would have you coming right back with Porter? RAY ROBINSON: I thought the Solomon fight should have been a draw and I beat Porter. Even Antonio Tarver came back to the dressing room and thought I won. KEN HISSNER: You have won your last eleven fights and it’s been six and a half years since your last loss to Porter who is No. 6. You just turned thirty-one. Are you ready this year to get that title shot? RAY ROBINSON: Yeah man. I have to be patient. This is the best I felt since I was 21 or 22. It’s overdue. KEN HISSNER: After Ray Nahr beat Ronald Cruz you stopped Nahr. Were you surprised Nahr got a fight with Jesse Vargas? RAY ROBINSON: Vargas barely got by Nahr. The knockdown at the end must have won him the fight. Why didn’t I get a fight with Vargas since I beat Nahr. KEN HISSNER: You have two former world champs ahead of you in the WBC rankings. Andre Berto is No. 8 and Amir Khan is No. 1. How would you like to meet one of them? RAY ROBINSON: I would love too. I have been calling out Berto forever. Kahn has no chin. He better not go to Chicago or a good wind might knock him out. KEN HISSNER: I understand you have a new manager in David McWater. How’s that working out? RAY ROBINSON: He’s a good guy. He’s honest and straight with me. He knows I’m hungry and he know’s I’m not getting any younger. KEN HISSNER: I have a feeling if you could get Berto after your next fight you would not only move up in the WBC but get into the IBF since Berto is No. 3 for Kell Brook’s title. What do you think? RAY ROBINSON: Each champ stays with their own contender’s safe under their umbrella. KEN HISSNER: What do you know about your next opponent Edwin Palacios? RAY ROBINSON: I train every fight like it’s going to be my last fight. You can’t go by records. A guy could have a losing record and be better than an opponent with a good record. I train the exact same way no matter what their record is. KEN HISSNER: Ray, as always it’s been nice talking to you and I wish you all the success in the world this year. RAY ROBINSON: Thanks man I really appreciate it. Time for these belt holders to stop avoiding Ray and give him a fight.